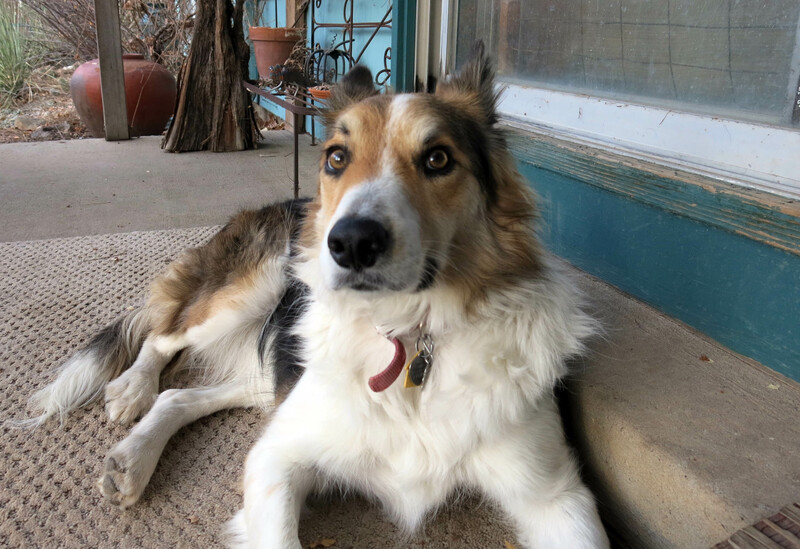 Greetings and salutations, everyone; yes, once again it is I, Mani the purebred border collie, filling in for the guy I live with, and here to bring you up to date on the news from our garden. You may remember me from such posts as “A Slight Change”, among so many, many others. Here I am in a characteristic pose. I might be looking a bit dubious here. Possibly because of the excessive number of sibilants in the title of today’s post, or possibly just because. I’m not always sure what the guy I live with is up to, these days. The weather has been pretty nice. Today it was seventy-five degrees F (about twenty-five degrees Celsius), with nine percent humidity. It’s supposed to snow a bit, tonight. No, really. 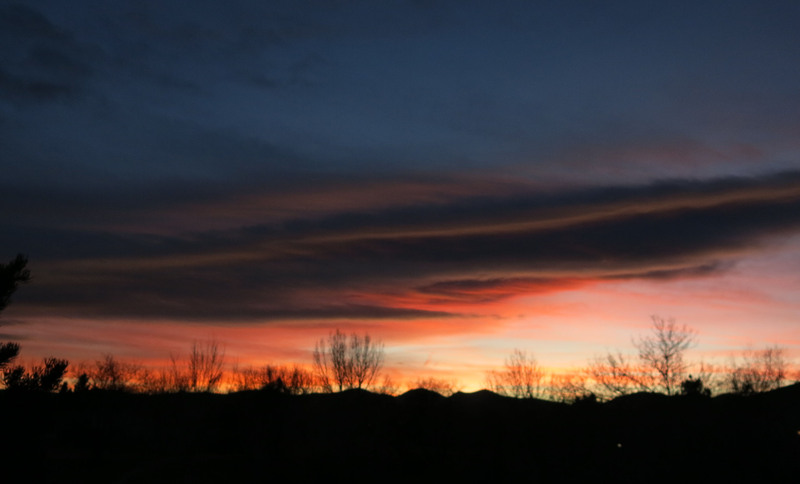 There was wind coming off the mountains which has been giving us some spectacular sunsets. 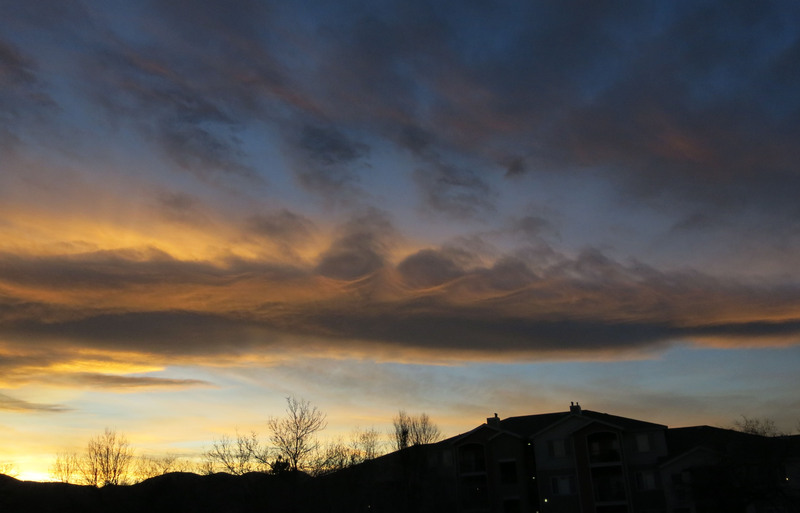 You can see the way the wind was making ripples in the clouds. In this one here, which I thought was a bit frightening, those lighter lines are caused by what you might call waves of wind, off the mountains. 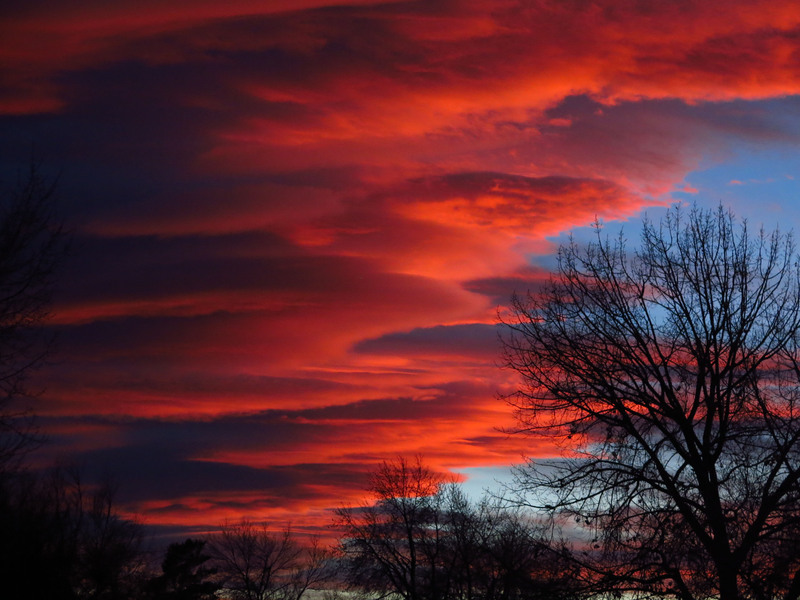 Then yesterday evening the sunset was just super red. The guy I live with took this picture, zoomed in a bit, on our evening walk, looking south. This is mostly the whole sunset. 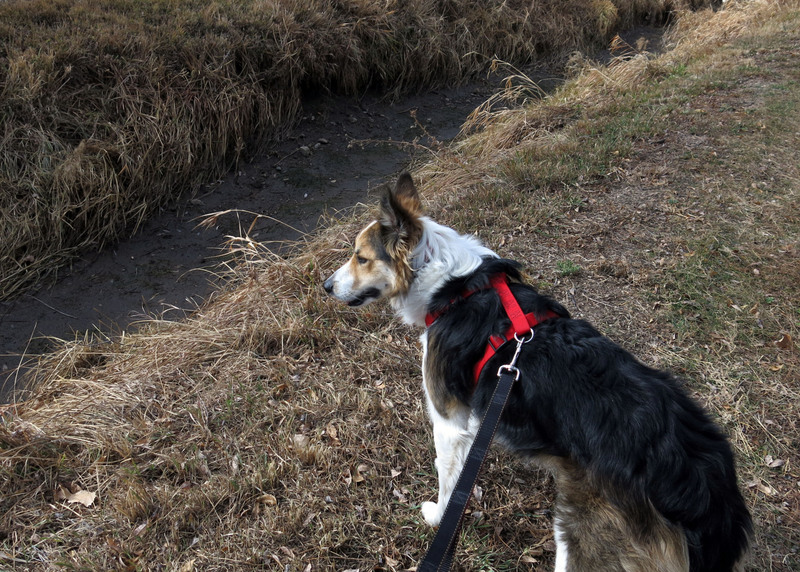 The water stopped flowing in the canal, either on Thanksgiving or the day before. You can tell that winter is coming just by looking at things beside no water in the canal, even though it’s been so warm. This is Geranium dalmaticum, which the guy I live with said came from Lamb Nurseries in Spokane a very long time ago. 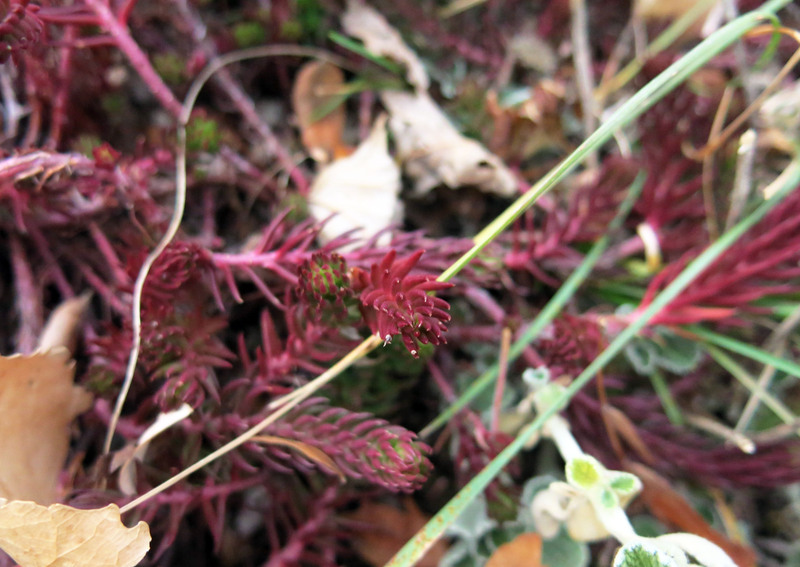 The sedum which we don’t know the name of has turned a very dark red. 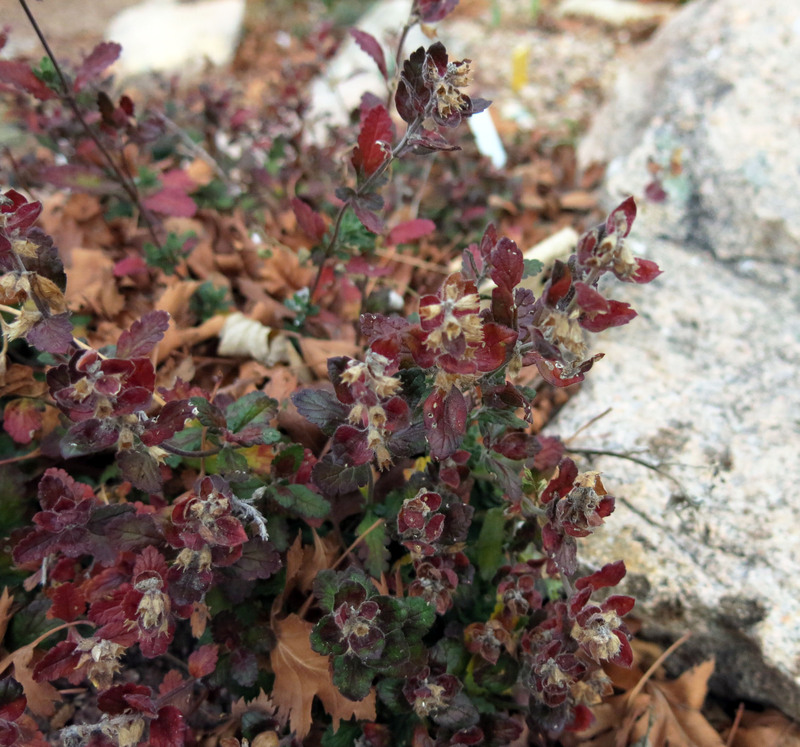 Teucrium montanum has turned color, too. The guy I live with said he’d never noticed that it did this. 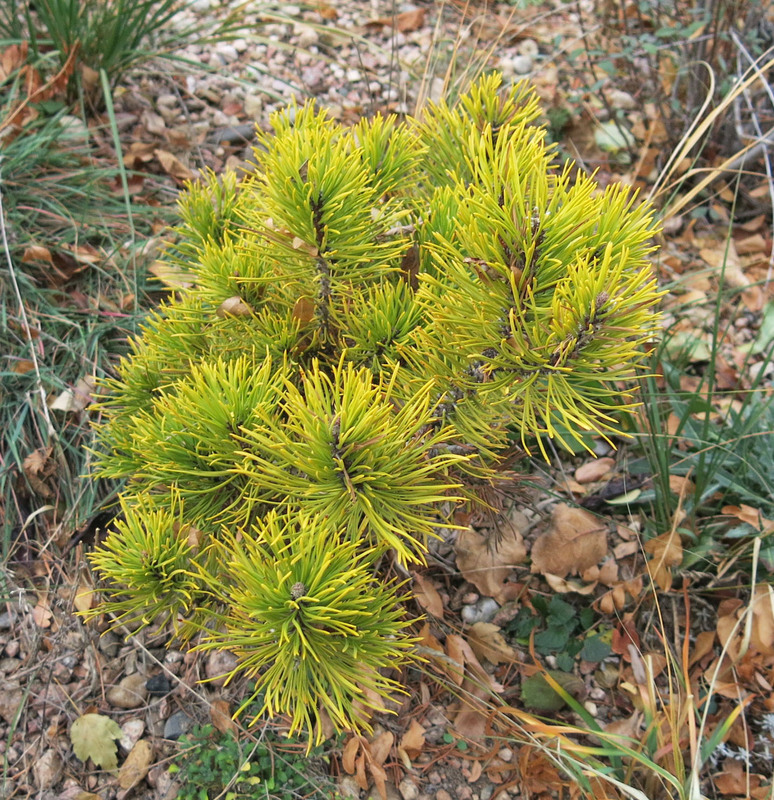 Pinus mugo ‘Carsten’s Wintergold’ (or just ‘Carstens’) is turning, too. The guy I live with went through a dwarf conifer phase some years ago, and a few of them survived. And Crocus longiflorus is flowering. 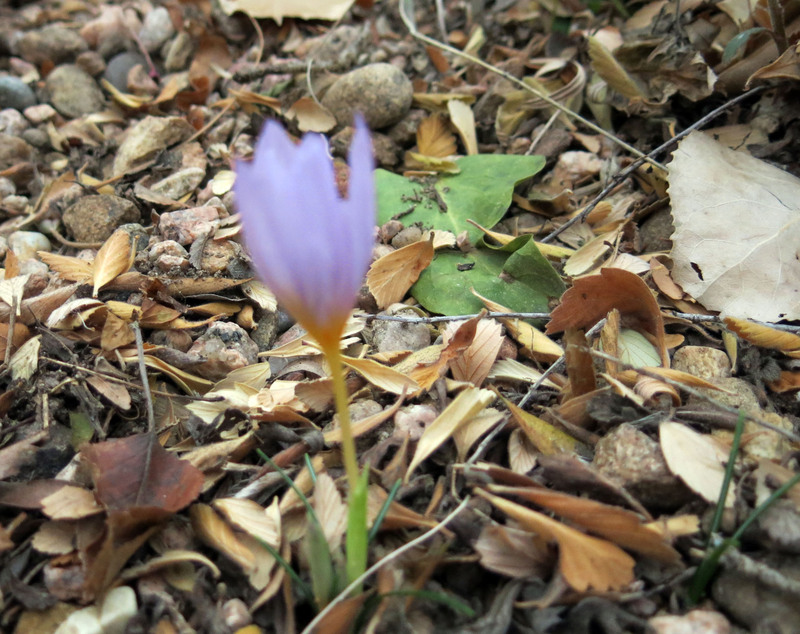 This picture isn’t in focus, obviously, and the color is all wrong (it’s a lot more pinkish-purple), but at least the crocus is flowering. It started flowering at this time last year, too. The guy I live with says he has no idea where this came from. The crocus is native to southwestern Italy and Malta, so that’s originally where it came from, but he doesn’t remember where he got it, which in itself is a bit scary. Speaking of crocuses, there has been a great deal of moping over Crocus biflorus subsp. melantherus, which is also called just plain melantherus. It’s a favorite here, and last year was in flower in October, but there was no sign of it at all this year. The guy I live with said we hadn’t had enough rain, which is almost always the case here, so he went out a couple of times with the watering can, and watered where the crocuses were supposed to be, and then put a “portable greenhouse” on top of where he watered. These little greenhouses are kind of conspicuous but they do work. So look what we found today. Speaking of finding things, well, this next section might be extremely boring. You can skip it if you want to. The guy I live with has been looking in the Snowdrop Frame a few times every day and wondering where the heck everything is. I would point out that since he doesn’t do much of anything, looking every single day might give the impression that it’s taking longer for things to happen than it might if he only checked every three or four days. 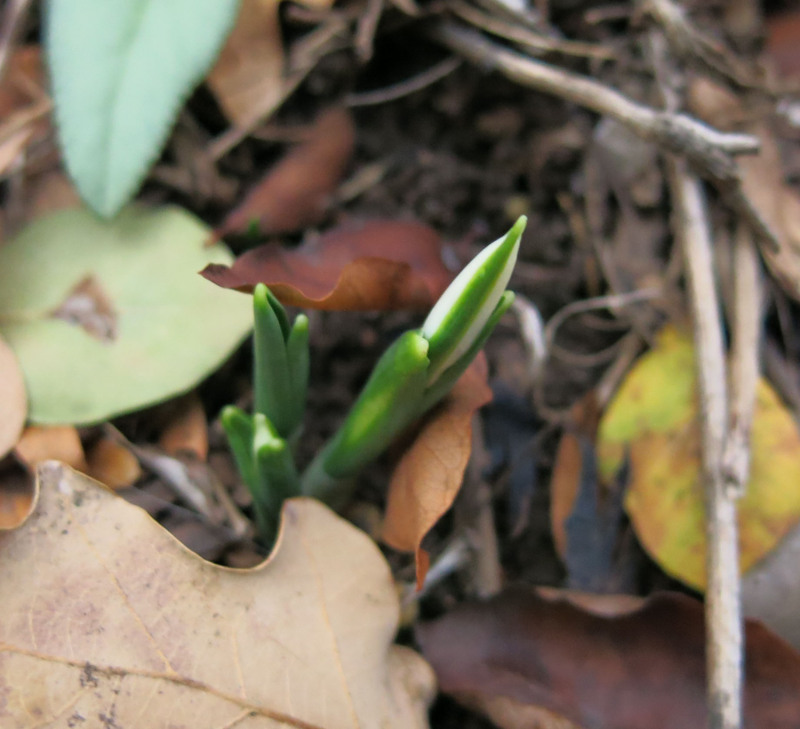 At least one snowdrop is almost in flower. 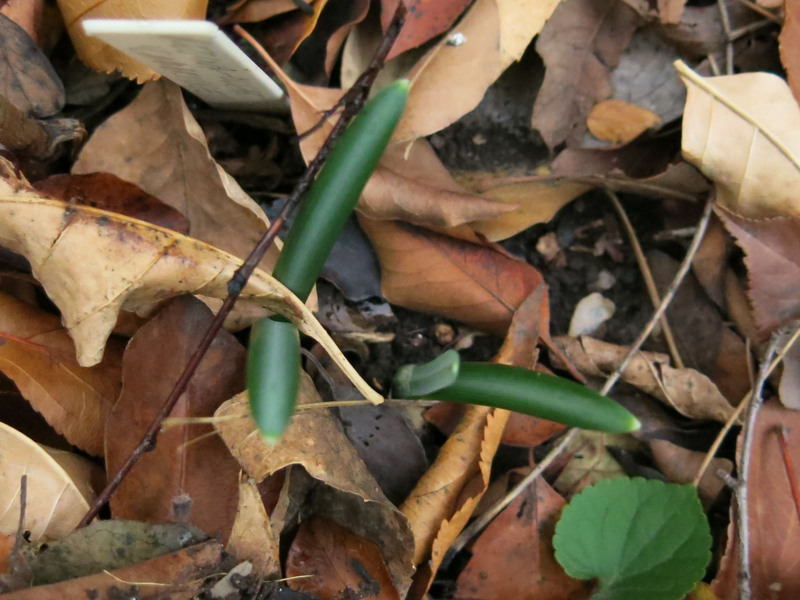 This is Galanthus elwesii var. monostictus Hiemalis Group ex Broadleigh. That’s really its name. We purebred border collies are far too refined to let out a guffaw in instances like this, but, well, you know, it’s worth at least a snicker or two. Well, there are a few others of its ilk here, as well. The trouble is that they were transplanted from another area of the garden where, at this time of year, they were in too much shade to flower, and–I’ll put this diplomatically–now that they’ve been moved, there’s some uncertainty at to exactly where they are, because the labels may not be where they’re supposed to be. I couldn’t help at all. 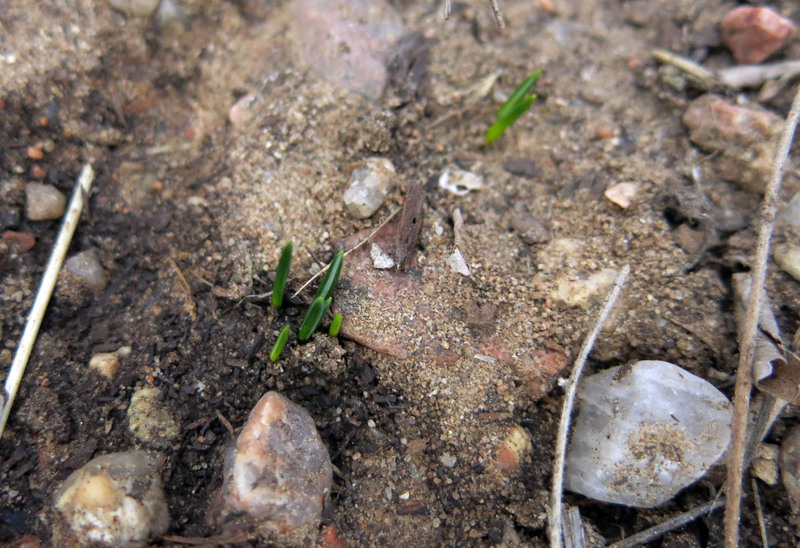 However, if you look at this picture, you’ll see green near the two labels at top left and top right, and then at least two more snowdrops at a considerable distance from the labels. So …. 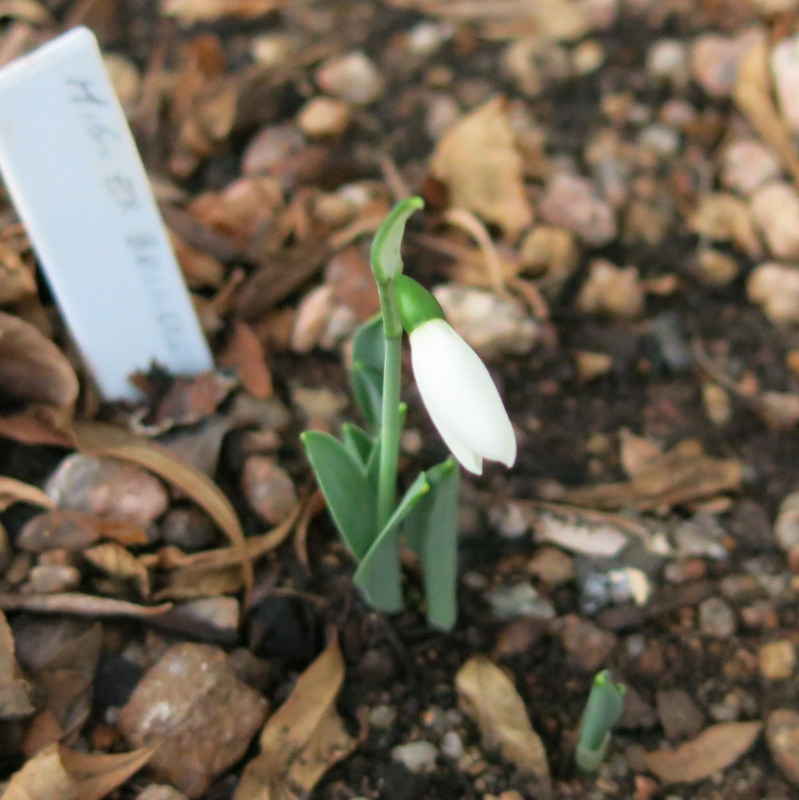 The actual label for ….ex Highdown is lying on the ground in the shade garden on the north side of the house, where the snowdrop used to be. I’m not so sure, but let’s say it will. Then there was a bunch of moaning about Galanthus elwesii ‘Three Ships’. It got its name from the Christmas carol, you know; it “should” have been up by now, in order to flower about the time you start hearing “I saw three ships” playing in the stores, a few hundred times an hour. But then yesterday, I heard a triumphant cry from the vicinity of the Snowdrop Frame. Imagine my sigh of relief. In the shade garden, where I don’t go (there are fences and gates), the guy I live with said that even though Galanthus reginae-olgae ‘Cambridge’ didn’t flower this year, because of lack of rain, it has obviously increased, after being in the garden for a few years. You can tell it’s what it is because of the stripes. 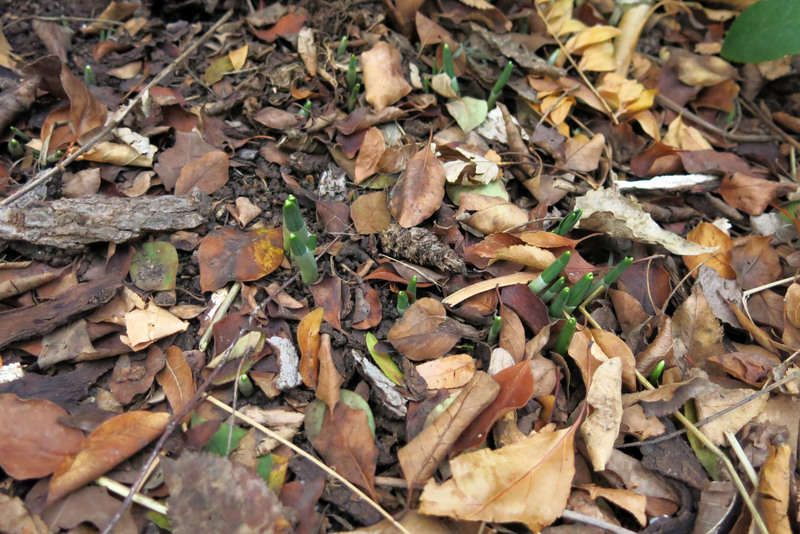 There are a lot of other snowdrops up, too. This isn’t really unusual for this time of year. 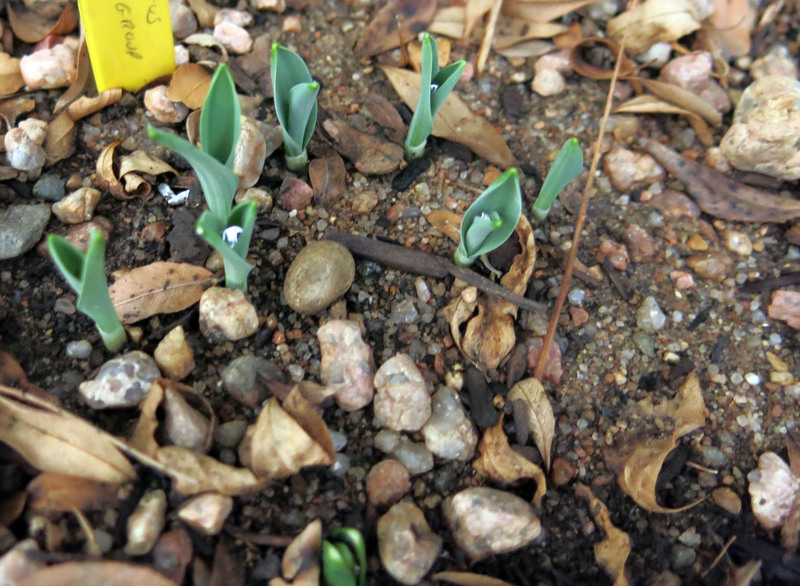 These are probably Galanthus elwesii ‘Teresa Stone’. These came from the garden in Portland where they were first discovered. 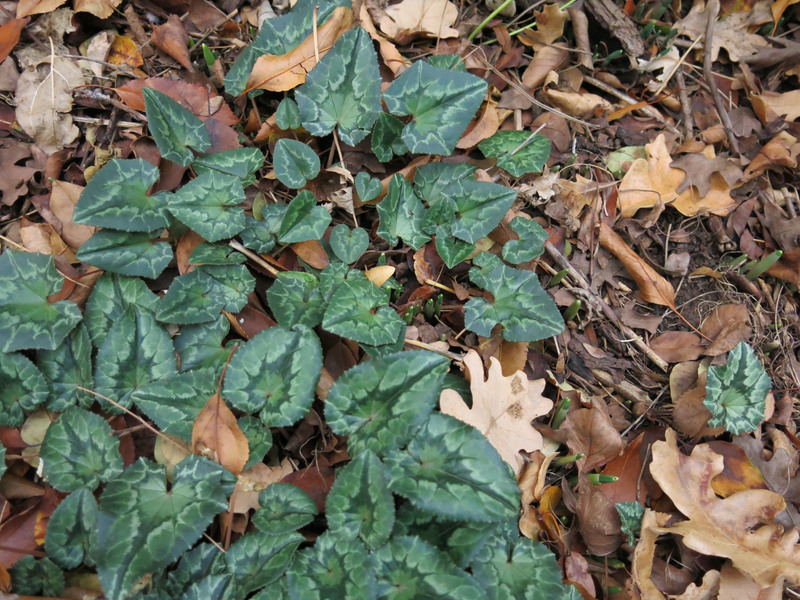 There are even more (not ‘Teresa’) around the leaves of Cyclamen hederifolium. If you look closely, I mean if you’re not already bored to tears, you can see a lot of snowdrops. Then there was this one, which seems very eager to flower. It has no name. Or, maybe I should say it has no label. (When the fence was put up along the north side of the shade garden there was a lot of snapping-off of labels.) Okay, that really is it for the snowdrop business. I have some pictures of me to show you now. I make pretty cool shadows at this time of year, because of how low the sun is. Here I am doing an impression of a wild boar, again. This is a goat. This is a ferocious and deadly wolf. This is a horrible canine from another dimension. (But on a leash.) And this one, not to leave you with any terrifying impressions, is a kitty. I’m pretty good at this, aren’t I? I hope you enjoyed, or at least pretended to enjoy, this rambling post. 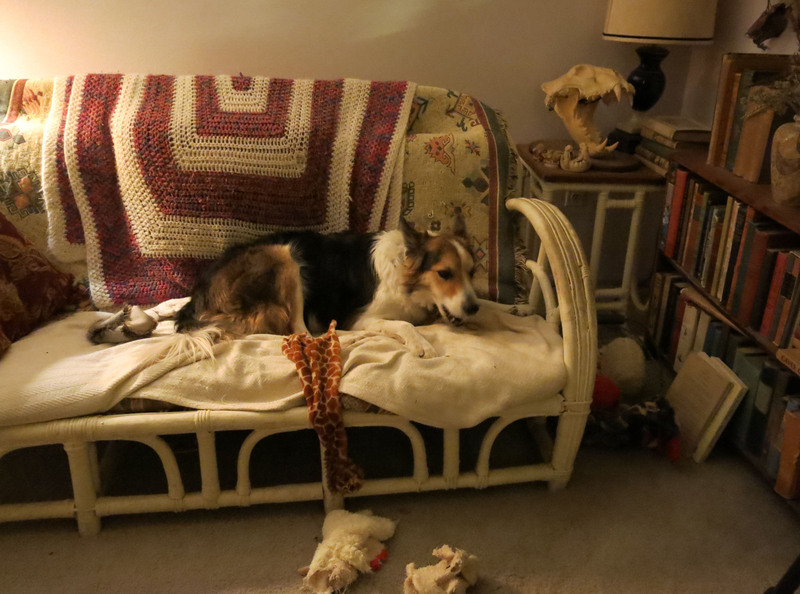 I’ll leave you with a picture of me, enjoying a biscuit, on the ancient rattan couch so many of us purebred border collies have loved, surrounded by my newly-washed toys fresh from the dryer. Why is your blog ‘the Miserable Gardener’? You certainly do not seem to be miserable. Neither does the guy you live with. At least you do not talk about him being miserable. The guy I live with says to look here. https://paridevita.com/2012/04/25/like-a-wave/ Things have changed, a lot, here, but changing the name of the blog seemed like way too much work. And anything remotely resembling work really isn’t something we care to think about. I am so sorry to bring that up Mani! I am sure that makes a lot of extra work for you, since all dogs are employed in the industry of expelling misery whether they are aware of it or not. Well, you likely enjoy your career. Oh, it’s not a problem at all. It’s something to be lived with. Besides, the blog was about nothing but that, with a little gardening, until Chess took over the blog. Making the guy I live with happy is one of my duties, though I do think driving him crazy is another. 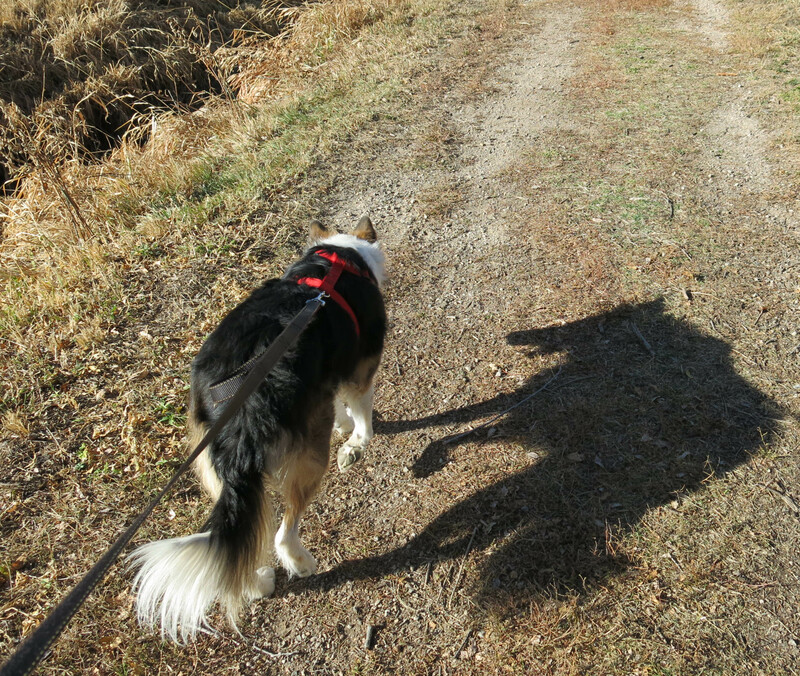 Your shadow impressions are awesome and realistic. I’m amazed you could do so many different animals. More, please (except the wolf, that was scary). Thanks. I agree that the wolf was pretty scary. Great blog! I love the dog’s viewpoint of your garden. Thanks. I personally think that a dog’s viewpoint is the superior viewpoint. The very best part of this post was your shadow impressions, Mani, so thanks for the chuckle they brought me this morning. 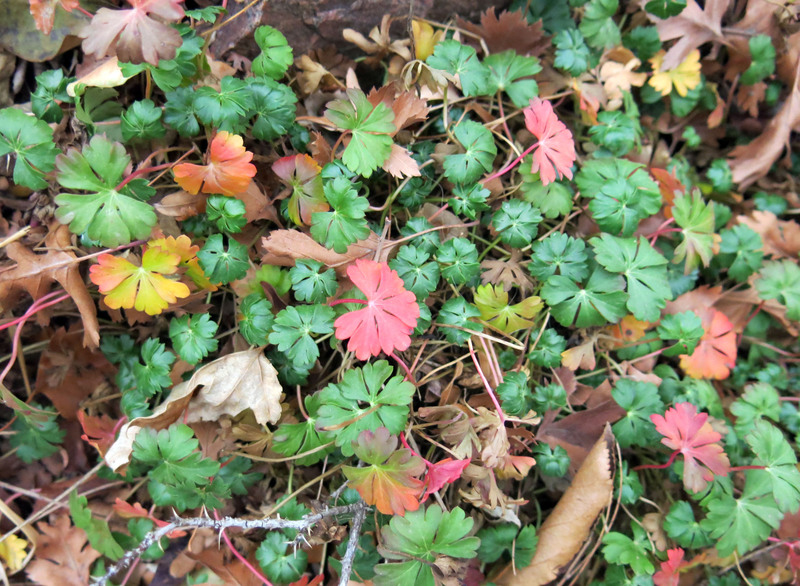 Next best was the wonderful sky photos, and then that one shot of Cyclamen hederifolium foliage. When I saw it (after having skipped all the boring Galanthus talk — I’m one of those undiscerning people who thinks they are all much of a muchness), I was tricked into thinking he’s going to talk about Cyclamen, but no, it was more Galanthus talk. Thanks. 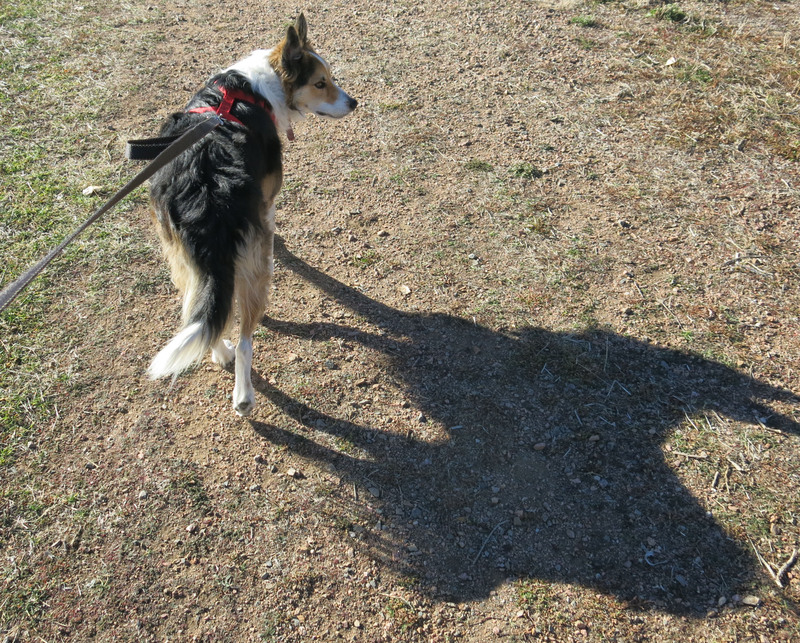 The guy I live with said we might work on my shadow impressions, some. He also says that the genus Galanthus is one of the very few in which each species is readily distinguishable without using a magnifying glass. There is one subspecies which you have to dig up to determine what it is. Or look at the label. They might be less interesting, as Graham Stuart Thomas said, if they flowered in spring or summer. Frightening shadows. Very scary stuff. Bunnies are cute yet I didn’t see any, everything had such sharp pointy teeth. 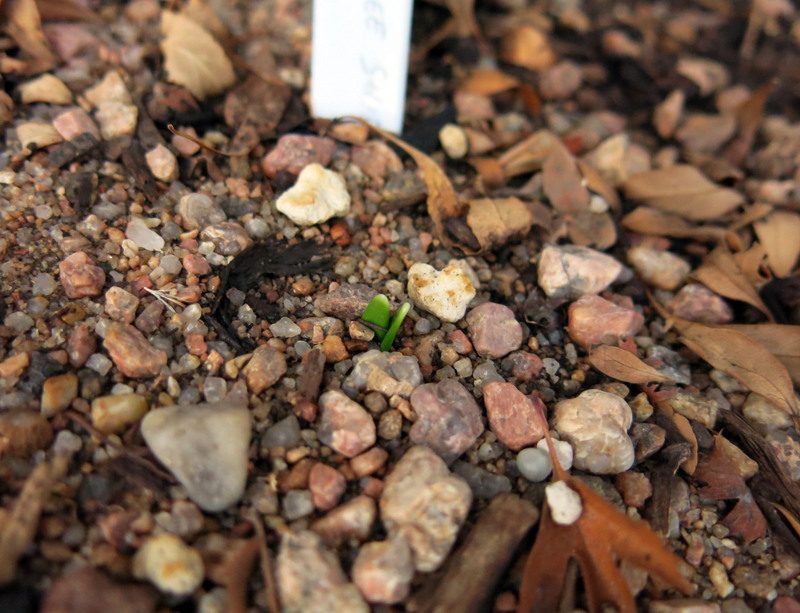 That does seem like a big deal to make over some little snowdrop sprouts and buds. I’m sure such a fuss wouldn’t happen here. 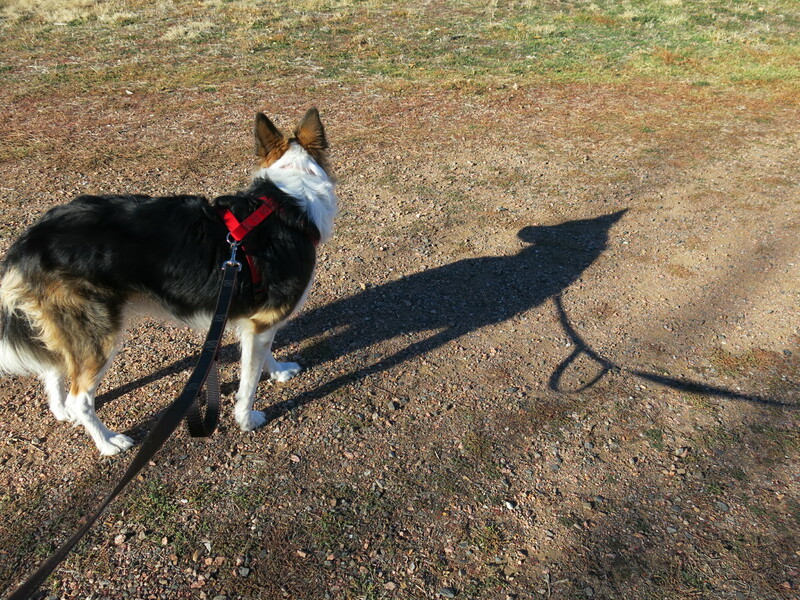 Thanks; I have to work on a bunny shadow impression. A huge deal is made over anything that’s planted here and doesn’t come up. Sometimes, and the guy I live with says you should never do this, there’s a bit of digging, with the fingers, around where the planted bulb is thought to be. It’s often somewhere else, of course. Well, if you were interested in snowdrops, the guy I live with says that yes, the Hiemalis Group do survive in the open garden. At least here. The ones in the Snowdrop Frame were in the garden until this year, when they were moved, because they need more water (which in normal climates comes as rain) and sun at this time of year. (Moving them seems to set them back a bit.) The frame is covered with plastic but that doesn’t really keep anything toasty. All new snowdrops go into the frame, now. Sometimes even close to the labels. However, the new plan is to plant them in gallon pots and “plunge” the pots into the frames, so the bulbs can be more easily found. Then maybe later they can be twin-scaled. I need to speak with my fall drops. Maybe I can toughen them up enough to leave them out…. or better yet finally build that snowdrop frame I’ve been promising them. A frame would be excellent. Or a fancy greenhouse, or cool house, like some people have. Well I have to say I have noticed from reading garden blogs from ‘across the pond’ that snowdrops are a thing. There seems to be quite an obsessive community around them; similar to some of the succulent people .I am far more interested in succulents, but I live in California and snowdrops just don’t work in my environment (though that has never stopped me before) and I’m far better off collecting Salvias and Gasterias. 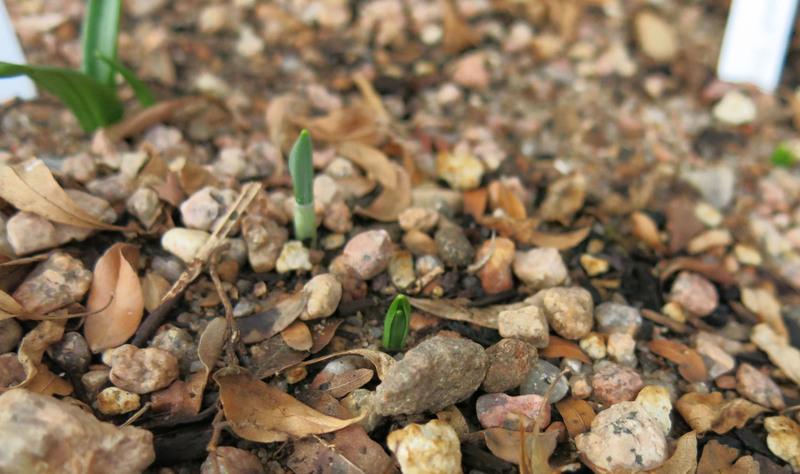 No, growing snowdrops in California might be considered an esoteric pursuit. The guy I live with said he often gets the same thing about growing snowdrops here. (Or almost anything, really.) More than half the species of Galanthus are native to Mediterranean-type climates, in Greece, Turkey, and all around the Black Sea, but they seem to do just fine here. We also grow a lot of succulents, though there are issues. With squirrels. You can see the elegant chicken-wire defenses against squirrels in the pots filled with hens and chicks, and things like iceplants are completely hopeless here. Squirrels think they’re jelly beans. Twin-scaled, Mani? Define, please, for those of us less than obsessed about — well, whatever. At least you know the guy you live with is highly competent at being obsessive. Snowdrops *are* pretty, and, after all, he went to a bit of trouble to transplant, frame and water them. 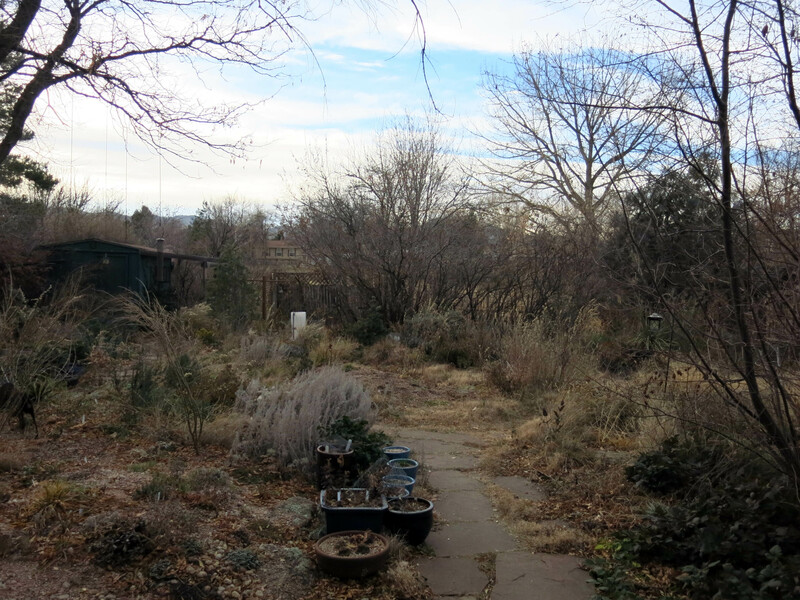 Your garden otherwise – with the exception of the crocus – is exhibiting holiday colors. Which came first, holiday or festive colors? Maybe both together. 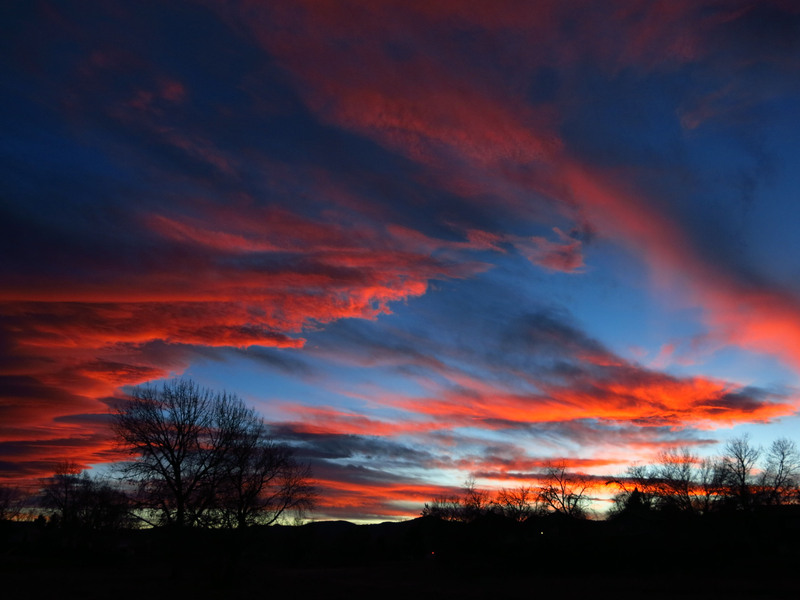 How does the guy you live with manage to both hold on to your leash on the evening walks while manipulating a camera to photograph the gorgeous sunset skies? I’ve oft wondered. In my opinion, Voice of the Dog wins out over a miserable gardener any day. Go preen. Or throw another shadow for us. Thanks, I agree that dog voices are vastly better than the voices of the sad. The guy I live with is, overall, not hugely sad, though you may understand that this time of year can cause certain emotional things. (The guy I live with went with his friend, who lost her mom a couple of months ago, to a “coping with the holidays” seminar and it was very insightful. I guess a lot of those things really aren’t.) But anyway. Twin-scaling. http://www.judyssnowdrops.co.uk/Propagation/Twin-Scaling/twin-scaling.htm The camera in question is a Canon PowerShot G15. Not very big. 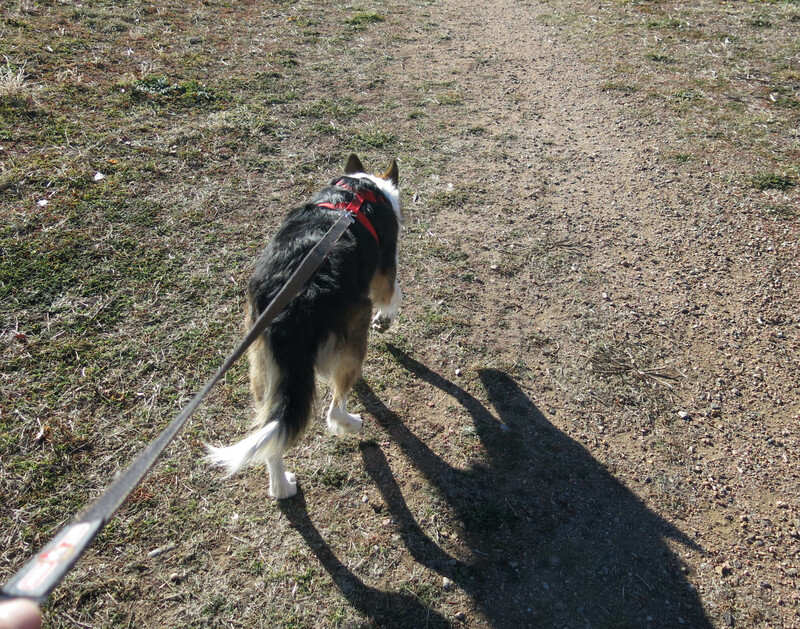 The camera is now carried on all of my walks, because things get missed. We have to stop, every so often, and the guy I live with just points and shoots. With the sunset pictures only part of the bottoms of the pictures was cropped; nothing else was done to them. It’s a hard time of year when you miss someone. 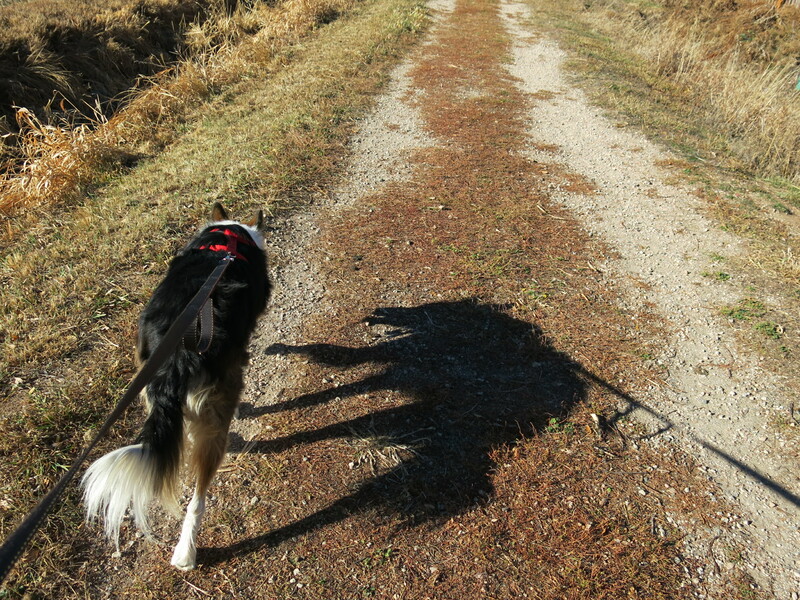 Those shadows are great and it takes someone special to even notice them. Were other pictures taken with shadows that didn’t look like much? And, how come the water stopped flowing in the canal? Does someone shut it off from somewhere? I should make an intelligent comment about the many snowdrop snouts, but I’m another unsophisticated type who just grows the ordinary ones. They are pleasing. Yes, it is a hard time of the year, especially if you lost someone who really liked the time of year. The guy I live with said that he decided to paint the house, starting with the living room. He took pictures of everything so that things would be put back the way they were. The only thing in the room was the couch. (The carpet was so dirty is was okay that paint flew all over it; new carpet was installed the following January.) Doing little things. Believe it or not those were all the shadow pictures. The water in the canal is irrigation water for somewhere to the east. It gets shut off around this time of year because the irrigation isn’t necessary. It has been good over the years watching your life get less miserable. I used to order from Lamb back in my Seattle days and I ordered from them when I moved to the beach. They visited here and then moved here because they were losing their lease in Spokane. But they set up their nursery on land that flooded and then closed within a year. The guy I live with says Thanks, but this morning he discovered that someone (not me) had eaten the snowdrop flower last night. He forgot to close the frame all the way. There are probably labels from Lamb around here, somewhere. Sad to see all the old nurseries gone. Sorry about the snowdrop. Curses. Thanks; yes, one flower horribly bitten off. Of course, the most important thing is that the bulbs increase. This particular one has only been here for a couple of years, so vegetative increase, making more bulbs, is more important than flowers. Well, we like them here because they flower at this time of year. Though the temperature just dropped a bit. It was 81F last Monday; 34F today.